Polaris ATV Forum > Polaris Model Specific Discussions > Polaris Sportsman 570 > 2017 How to get engine code ? 2017 How to get engine code ? Check engine light came on for a few seconds, then went away . The display said "chk eng" or something to that matter..
How do I get the code ? 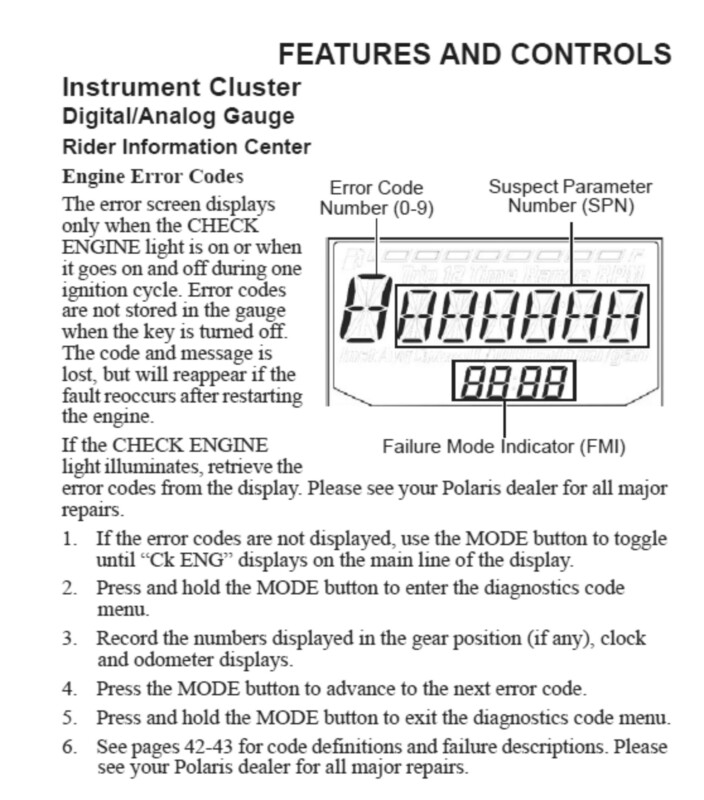 In order to retrieve codes, the Check Engine light must be on. If it's off, there's no way of retrieving historical codes via the display. Only way I believe is to have a dealer hook up their scan tool. Ok, can you tell me how to do that? So if it stays on, i know how to get the code ? So, if check engine light goes off, but the display still says check engine, i can not pull code ?????? If the CEL indicator light turns on then goes off during one ignition cycle but the ignition key IS NOT turned off and Ck ENG is displayed, you can retrieve the code. See below. Ok , where can I find the list of codes saying what they are ? So that once I get the code, I can actually see what it means ? They are in your owners manual. You can download your manual if you don't have one. Last edited by mvn; 08-29-2018 at 08:27 AM.